Polus Delegation: Michael Lundquist, Executive Director of the Polus Center, Adrien Nzuzi, Polus Center, Program Director, Polus Congo, Yves Iradukunda, Senior Director, Mass Design Group based in Kigali, Rwanda, Troy Word, Videographer and Kelab, Security, arrive and meet with members of the ...........co-op on Idjwi Island. A Delegation from the Polus Center arrived on the island of Idjwi in the Democratic Republic of the Congo to meet with coffee cooperatives and assess how injured coffee producers, who have lost their ability to farm due to injuries sustained by landmines /explosive remnants of war, might return to work. Whether it is coffee production or another employment option within the coffee industry value chain – as cuppers, coop administrators/managers, baristas, retailers, roasters, etc. the intention is to become integrated into a coffee cooperative, and return to work. 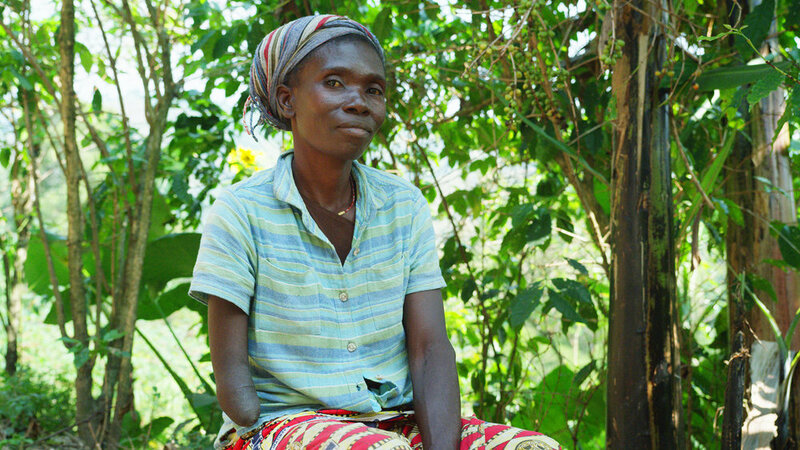 Cifa, a 38 year old coffee producer and ERW survivor, has a below elbow amputation on her right arm. She is married with three children who all work the farm because she does not have enough money to pay for their education. For farmers like Cifa who rely on coffee as their sole cash crop, becoming injured is often less about the injury, and more about losing their livelihood. They just want to be able to support their families, provide an education for their children, and improve their lives. This delegation is a follow up to last years visit where partnerships were established with On the Ground, Eastern Congo Initiative, Centre Pour Handicapes Physiques (CHP), and the US State Department Office of Weapons Removal and Abatement (PM/WRA) to build the Lake Kivu Alliance and provide prosthetic services to coffee farmers injured in landmine blasts in the Lake Kivu region. Providing prosthetics, rehabilitation services, and improved accessibility are at the heart of the Polus Center mission, and the development of an accessible coffee washing station to address the new found challenges faced by injured producers is already in the works. The delegation visited Rebuild Womens Hope, a 2,100 member coffee cooperative, where Marceline Budza, the Coop's AG, led the delegation to the washing station. "The design of the station itself does not lend itself to supporting people with disabilities - and this is true of all the washing stations that we have visited in the DRC" says delegation head and Polus Center CEO, Michael Lundquist. "A universally designed washing station will not only be more accessible to landmine victims and others who suffer physical mobility impairments, but also be more efficient for everyone" says Lundquist. "These efficiencies help overall production and quality - if we can develop this washing station, it could become a prototype for the entire industry". At Rebuild Women's Hope coffee coorperative, Marceline Budza, the Coop AG (center), provides Michael Lundquist (left) and the delegation with a tour of their washing station after a warm welcome from coop members with singing and well wishes. Coffee cherries are brought to the washing stations by coffee producers, predominately women who carry large heavy sacks on their backs, often for considerable distances. After visiting Idjwi, the delegation attended Saveur Du Kivu. This specialty coffee cupping competition and annual meeting for representatives throughout the international supply chain supports the construction of DRC’s specialty coffee industry which is playing a vital role in increasing economic stability and peace in the region. Polus Center delegation members Dennis Hadrick, PM/WRA, Adrien Nzuzi, Polus DRC Program Manager and Chris Treter of Higher Ground participated in a panel presentation on public/private partnership and the impact of landmie/ERW on coffee producers within the DRC. By providing insightful post conflict analysis and sharing our work to provide prosthetic rehabilitation services to coffee farmers who have been injured by ERW/landmines in the Eastern Lake Kivu region through the Lake Kivu Alliance, the Polus Center delegation hopes to promote inclusion, and create a more equitable representation of vulnerable populations throughout the coffee value chain.